Nail Polish Pahlish Sitting In a Tin Can, On Black Friday I did not partake in the mayhem that many people in this country do for the sake of a good deal. I was however planning my Cyber Monday shopping with the various Indie polish companies that had great deals. One of the companies who was having a sale was Pahlish and from them I purchased Sitting In a Tin Can and Dark Parades. Their polishes are sold on Etsy and are between $7-$9 per bottle. 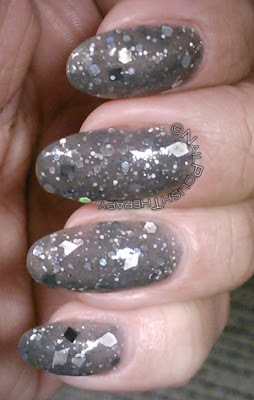 Sitting In a Tin Can is a grey (barely) jelly base with a chock load of multi-shaped white, black and holo glitter. My favorite parts of the polish were the color and the diamond shaped glitter. This polish was fun to apply because with every single swipe there was a lot of glitter that came out. I hate fishing for the cool pieces in a bottle of glitter and this was not the case with this polish. I used 3 coats because I wanted an opaque layered look. I enjoy building the glitter and making some of them look like they're buried or peeking out from under the base. The only thing with this polish, as with many glitter heavy polishes, is that it got very thick after the second coat. Over all it's a great polish and I would repurchase from them since the shipping was fast and I had no major problems with the application as I have with other Indie polishes. Stay tuned for Dark Parades in a future post. Thoughts? Feelings? Concerns?